Bitter melon, also known as ampalaya or by its scientific name Mormordica charantia, is a plant with a variety of benefits. Bitter melon has long been used in traditional Chinese medicine to treat diverse ailments, ranging from diabetes to parasites. Western medicine has also recently embraced the healthy benefits of this plant. In addition to being good for its medicinal properties, it is also a healthy food that many people use to cook a variety of delicious dishes. Bitter melon is the name of the tropical and sub-tropical plant that grows in Asia, Africa and South America. It is a vine with green, fleshy fruits. Bitter melon fruits are distinct from other types of melons because of their distinct surfaces. You can easily identify bitter melon fruits by their green, wrinkly and uneven surfaces. The fruit is colloquially called “bitter” melon because of its strong bitter taste. Bitter melon has been used in traditional eastern medicine for centuries. Bitter melon can be prepared as a herbal remedy in many ways and used for treating diverse health problems. According to the Philippine Department of Health, bitter melon should be used to treat stomach problems, respiratory problems, skin breakages, headaches and blood sugar issues. In that country, bitter melon leaves and seeds are ground into a juice that is imbibed to cure parasites, diarrhea and other stomach issues, as well as coughs and respiratory infections. Warm leaves are applied to skin to treat burns or cuts. For other ailments, such as headaches or blood sugar problems, the Philippine Department of Health recommends drinking juice from the fruit and leaves. Although Western scientists have not been using bitter melon for centuries, they are now finding positive uses for the plant. According to the website Science Daily, researchers have completed a study that illuminated bitter melon as a promising treatment for type II diabetes, a disease that affects a significant percentage of the Western population. According to Memorial Sloan-Kettering Research Center, bitter melon contains substances that allow glucose to enter cells and be processed in cells just as insulin naturally does in a healthy body. Further research needs to be done before the correct dosage is ascertained. Further research also needs to be done on the effects of bitter melon on leukemia. In the laboratory, bitter melon kills leukemia cells; however, it is not yet known if this effect will be demonstrated in live human tissues. Bitter melon not only has medicinal properties, it is also a healthy food that can add variety to your meals. Bitter melon is eaten regularly throughout the world; however, many people who were not raised eating it consider it an acquired taste. 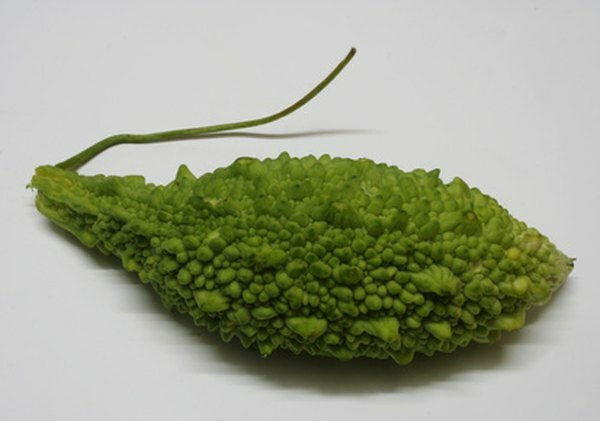 You may find it easier to eat when it is very ripe and sweet; when it is not quite ripe, it is very bitter as its name suggests. You should speak with your doctor before consuming bitter melon, especially if you are pregnant or have diabetes. According to Memorial Sloan-Kettering and ancient Chinese medical traditions, bitter melon is dangerous for pregnant women as it may cause vaginal bleeding. Bitter melon is also dangerous to people with diabetes, which is a serious illness that requires medical attention. The effects of bitter melon may cause negative interactions with diabetes medications. The seeds of bitter melon have been reported to confer varying levels of toxicity in children, ranging from gastrointestinal distress to death, so you should take care to prepare bitter melon properly when serving it.